Lynn, Eric, Ryan, Eddy, Chase and Russ with 1 Striped Marlin, 5 Mahi Mahi and 1 Shibi! 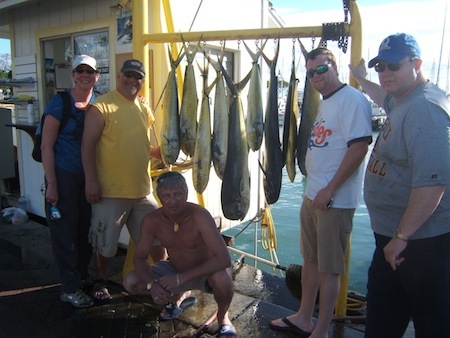 Mahalo to Lynn, Eric, Ryan, Eddy, Chase and Russ for choosing Maggie Joe Sport Fishing! The group departed Kewalo Basin, next to Waikiki, on sport fishing charter. While deep sea fishing outside of Honolulu, Hawaii aboard the Maggie Joe with Captain Mark they hauled in a Striped Marlin, 5 Mahi Mahi and 1 Shibi! Aloha! Katie, Bryce, Kelsey and Brice with 4 Mahi Mahi, a Needlefish and 1 Striped Marlin! Mahalo to everyone for choosing Maggie Joe Sport Fishing! It was a nice day out on the water aboard the Ruckus. The group hauled in 4 Mahi Mahi, a Needlefish and a Stripey while deep sea fishing outside of Honolulu, Oahu! Aloha! Eric, Mark, Nathan, Steve and Lucy with 11 Mahi Mahi! 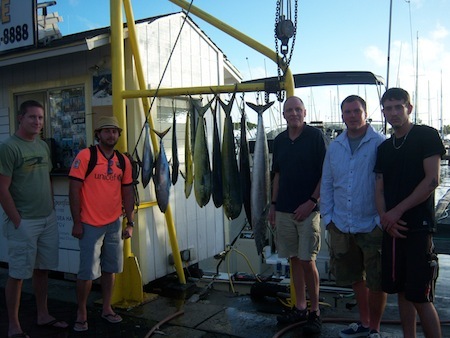 Mahalo to Eric, Mark, Nathan, Steve and Lucy for choosing Maggie Joe Sport Fishing! It was a nice day out on the water as the group joined us for a sport fishing charter. They departed in the early morning from Kewalo Basin, next to Waikiki, aboard the Maggie Joe with Captain Mark and crew. A day of deep sea fishing outside of Honolulu, Hawaii led to 11 Mahi Mahi! Congratulations and Aloha! Anton and his Short Billed Spearfish! Mahalo Anton for choosing Maggie Joe Sport Fishing! 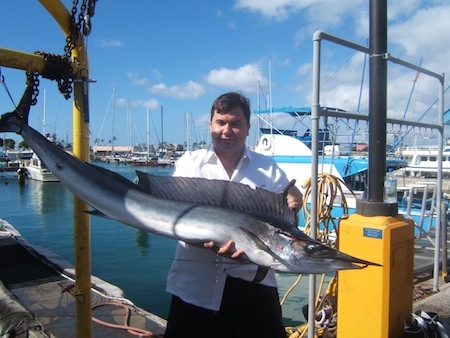 Anton joined us aboard the Sea Hawk on a sport fishing charter… the results… this nice looking Short Billed Spearfish hauled in while deep sea fishing outside of Honolulu, Oahu! Aloha and hana hou! Justin, Ed, Cory, Russel, Shel and Evan with their haul! 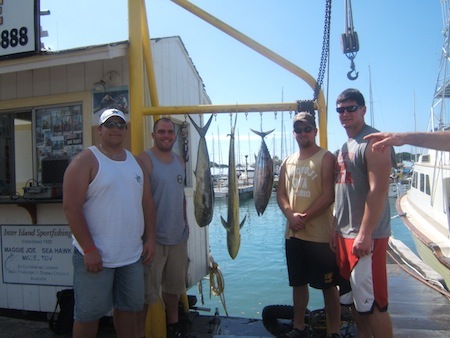 Mahalo to Justin, Ed, Cory, Russel, Shel and Evan for choosing Maggie Joe Sport Fishing! It was a great day out on the water as the guys joined us aboard the Maggie Joe on a sport fishing charter. While deep sea fishing outside of Honolulu, Oahu they hauled in a handful of Mahi Mahi, Shibi and Ono as well as a Spearfish and Stripey! Great job guys and Hana Hou! 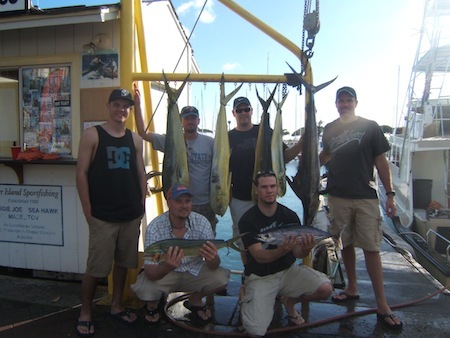 Bill, Brent, Khephren, Kiefer, Gavin and Bill with Mahi Mahi and Ono! Mahalo to everyone for choosing Maggie Joe Sport Fishing! The group departed Kewalo Basin, next to Waikiki, in the early morning hours on an Oahu sport fishing tour. While deep sea fishing outside of Honolulu, Oahu they hauled in a tasty Mahi Mahi and Ono! Aloha! 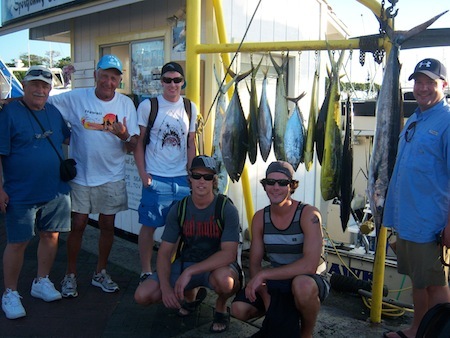 Jim with Captain Mark, Mate Mikey and 2 Ono and Mahi Mahi! Mahalo to Jim for choosing Maggie Joe Sport Fishing! Jim joined us aboard the Maggie Joe for a sport fishing charter. The day produced some good tasting fish and lots of fun as we found 2 Ono and a Mahi Mahi while deep sea fishing outside of Honolulu, Oahu! Aloha! Rob, Reed, Jordan, Steve, Nikos and Vassillies with Shibi, Ono, Mahi Mahi and a Stripey! 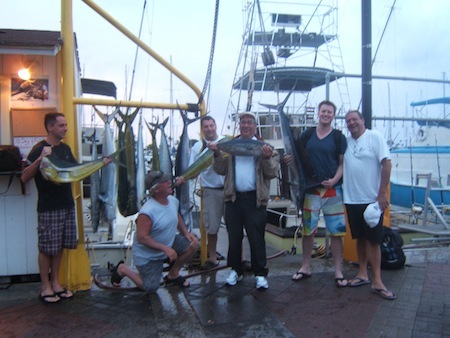 Mahalo to Rob, Reed, Jordan, Steve, Nikos and Vassillies for choosing Maggie Joe Sport Fishing! The group departed Kewalo Basin, next to Waikiki, aboard the Sea Hawk with Captain Darryl on a sport fishing charter. It was a great day out on the water as the guys hauled in a number of Mahi Mahi and Shibi along with a Stripey while deep sea fishing outside of Honolulu, Oahu! Aloha! 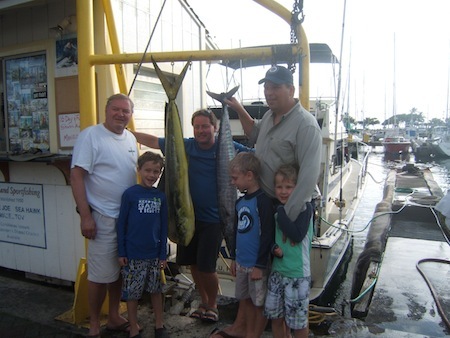 Nathan, Justin, Bruce, Steve and Jason with 2 Shibi, 5 Mahi Mahi and 2 Ono! 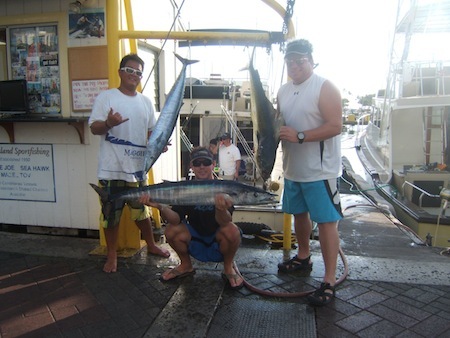 Mahalo to Nathan, Justin, Bruce, Steve and Jason for choosing Maggie Joe Sport Fishing! The group joined us aboard the Sea Hawk with Captain Darryl on a sport fishing charter. 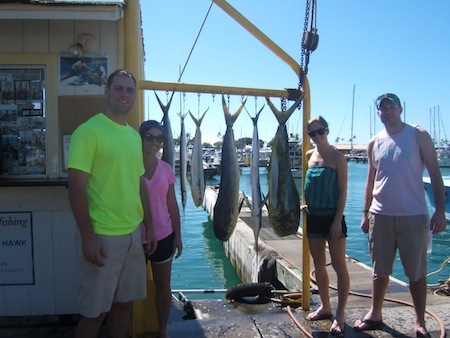 Their deep sea fishing adventure off the coast of Honolulu, Oahu yielded 2 Shibi, 5 Mahi Mahi and 2 Ono! Aloha!